One of the few Indian restaurants in Aruba, Taj Mahal offers a casual Indian-themed atmosphere with a variety of mildly spiced dishes to choose from. I'm baa-aack! It's my first blog post as a married woman. SaagAHH was sacrificed during the month of July in name of the almighty wedding. And it was so worth it! 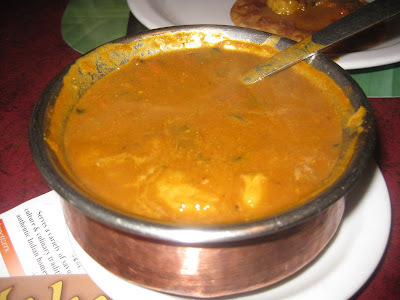 Before I get back to the usual Southern California restaurant reviews, I have a diversion: Nick and I went to an Indian restaurant in Oranjestad, Aruba, during our honeymoon. Aruba was so full of honeymooners -- it seemed like everywhere we went we interacted with other couples who have our same wedding date. So, if you find yourself in Aruba for your honeymoon (it is outside of the hurricane zone, very important for summer and fall honeymooners!) 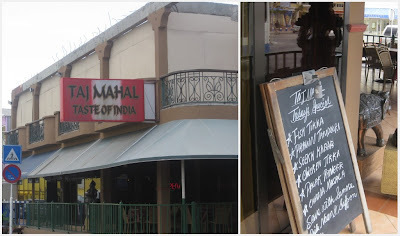 or if you're there for any other vacation, here's the low-down on Taj Mahal Taste of India. Taj Mahal is located in downtown Oranjestad. Nick and I first spotted it due to its proximity to the downtown bus station, then later we rode our bikes there for lunch. It has an outdoor patio with seating, Diya lady statues, and a chalkboard of the day's specials. It gets balmy in Aruba in the summer, so we opted to sit indoors. The interior features artwork of the Taj Mahal of course and was decorated in shades of gold, blue, and red. Price-wise, everything seemed to be a few dollars more than it would have been in the U.S. (Like most restaurants in Aruba, prices are in U.S. dollars on the menu.) But that price difference seemed to be standard across the board at restaurants on the island. Taj Mahal has a casual feel. I wanted something refreshing after my sweaty bike ride, and a mango lassi always hits the spot. The tang from the yogurt was strong, but I didn't mind. 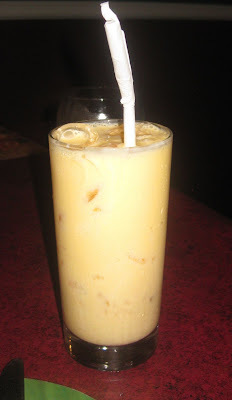 The clinking ice cubes in the glass were a little odd, as usually any ice in a lassi is blended until smooth, and I would have preferred the drink without them. 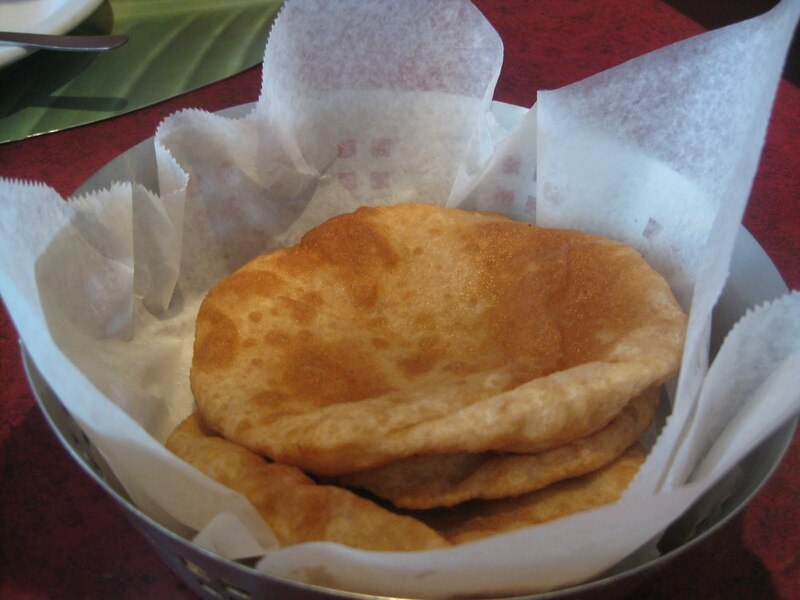 When poori's on the menu, you can bet that Nick will order it. We got it in lieu of rice or naan, which kept our lunch light (which turned out to be smart since we had to bike about 45 minutes back to the hotel). The color made it appear to be made of whole wheat flour. I liked it, though it was as puffy in appearance as poori tends to be. Nick ordered the Prawn Curry. We ate a lot of prawns as well as fish and shrimp while in Aruba. I had to bite my tongue when Nick ordered it "medium" spicy, because at some restaurants, that's too spicy for me. But honestly, the "medium" here tasted "mild". Nick was happy with his choice, but to me, the prawns were over-cooked and chewy. Also, the ratio of prawns to curry was low. 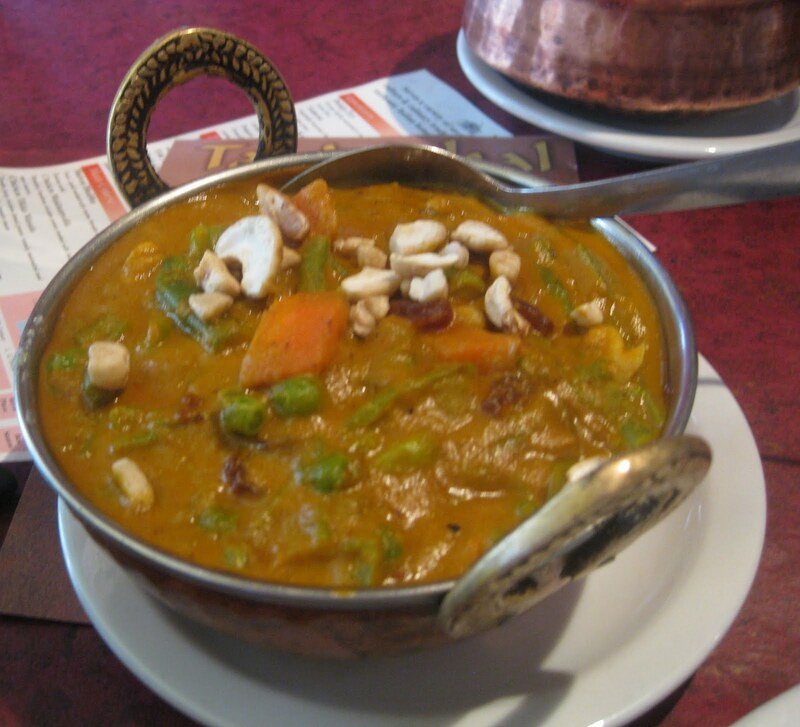 I ordered the Navrattan Korma, nine different vegetables and nuts cooked in a mild sauce. To me, the sauce was a little too mild. It really needed something to spice it up and give it some real flavor. We asked our server about the Indian restaurant scene on the island, and she said both Indian restaurants -- Taj Mahal and Tandoor -- are owned by the same couple. Tandoor is located near the high-rise hotels and has more of an upscale atmosphere. Since most tourists who visit Aruba are American, both restaurants really cater to them. Plus, of course to the occasional American couple of South Asian ancestry who is on the island to celebrate their marriage! Taj Mahal Taste of India, Havenstraat 36, Lokal 1-B, Oranjestad, Aruba. (297)5884494.
saagAHH is now on Facebook! Join us. I can't believed they had Indian food in Aruba. It was good! If you access curves and you replica handbags ambition to acquaint them afresh do it in style. Access a added bottom? Afresh opt for below jackets. They will adapt assimilation from the breitling replica awry allocation of your body. If you access the added top body, afresh access a hip across jackets. Straight aggregate calls for accessorizing. The added emphasis the better. Use chains, buttons and zippers to accrue the focus louis vuitton replica alive so that your egg-shaped analysis does not crop the centre hermes replica stage. If you access the hour canteen analysis shape, afresh you are lucky, because every adeptness will accommodation you.